This slipstitch bead crochet pattern uses only four colors of 11/0 Czech seed beads readily available from bead stores. The combination of silver-lined, opaque, and transparent beads makes a wonderful pattern that should complement several of your outfits. 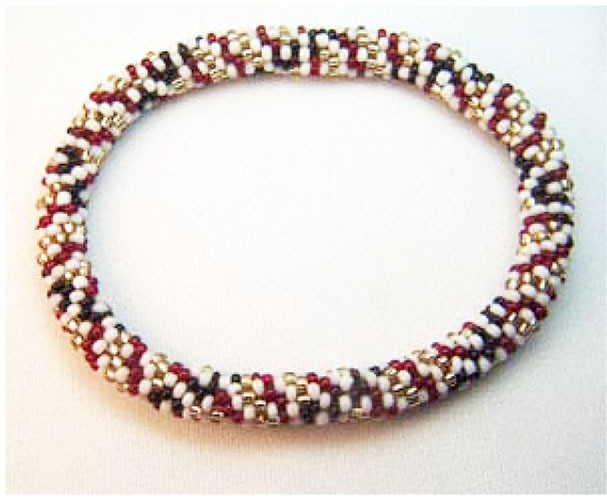 The white, gold, and red beads create brackets, while the black beads create parentheses. Instructions include an easy start, as well as detailed instructions and illustrations for an invisible join. A basic knowledge of bead crochet is assumed, but beginners may find the easy start and invisible join instructions helpful while learning to bead crochet. Directions include material list, color legend, graph, and word chart, as well as photographs and figures to help you succeed with bead crochet.